Star boxer Vijender Singh's "Chinese products" remark has provoked his next opponent Zulpikar Maimaitiali to issue a strong retort ahead of their eagerly-awaited bout titled 'Battleground Asia'. Replying to Vijender's comment that "Chinese products don't last long", WBO Oriental Super middleweight champion Maimaitiali said, "I will show Vijender what Chinese are capable of, we have shown India time and again what China is capable of, it's time that Vijender too learns his lesson. "I am coming to your home, Vijender, on 5th August and will take back your belt along with mine. I am going to knock you out in the early rounds," he said ahead of their scheduled bout in Mumbai on Saturday. 'Battleground Asia' fight night will give both the boxers a chance to claim double titles in a winner-takes-all show. The Chinese No.1 boxer said he was eyeing the second belt of his professional career. "I am fully prepared for this fight, this will be a big fight of my career as I am eyeing second belt of my pro career. I don't think he ever stood a chance in front of me, he thinks I am a kid. I will show what this kid is made of," said Maimaitiali. While Vijender is the current WBO Asia Pacific Super Middleweight champion, Zulpikar is the WBO Oriental Super Middleweight champion and whoever wins the upcoming fight will claim the twin titles. "Just pray for me. I will try my 100 per cent for another knock-out. 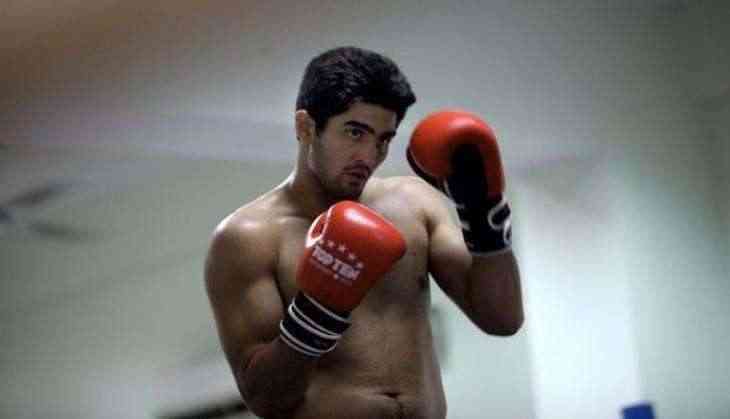 I will try to finish the bout as early as possible," a confident Vijender told reporters yesterday at an event.